Drift away to a tranquil, sandy beach with Nesti Dante Paradiso Tropicale St. Bath Coconut and Frangipani Soap, a perfumed cleansing bar that has been crafted using the old craft saponification method of boiling in a cauldron. 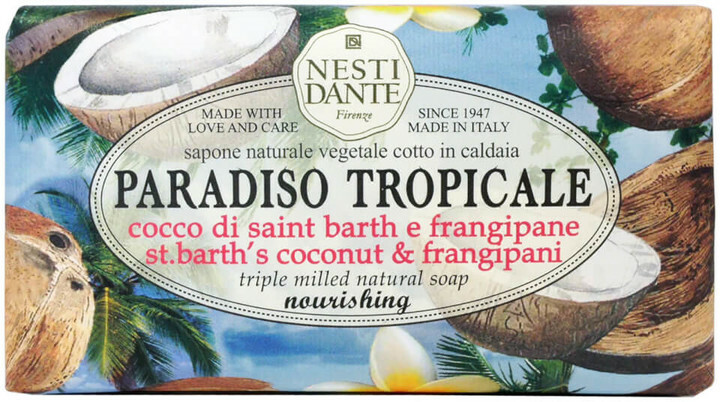 Developed in Florence with high quality ingredients, the natural, vegetable-based soap gently cleanses and purifies your skin to leave the body feeling soft and supple; it transforms into a rich lather that eliminates impurities whilst nourishing with extract of Cocos Lucifera Fruit. The triple milled soap is embossed and wrapped in elegant, decorative paper. Infused with an exotic fragrance. Natural. Biodegradable. No animal testing.